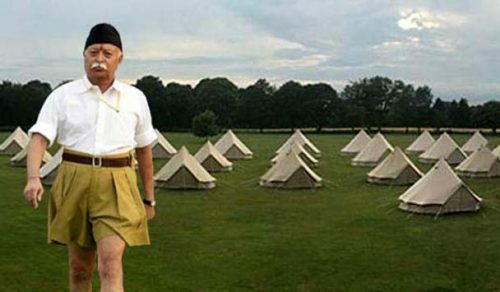 UK : A large number of tents have sprung up on the outskirts of London for a three-day event from Friday to celebrate 50 years of the British version of Rashtriya Swayamsevak Sangh (RSS), whose chief Mohan Bhagwat arrived here on Wednesday. The event, called “Sanskriti: MahaShibir 2016”, marks 50 years since the Hindu Swayamsevak Sangh (HSS) was established in 1966. Registered as a charity with regulator Charity Commission, it is headed by Dhiraj D Shah, based in Birmingham. Bhagwat, who arrived with senior RSS functionary Dattatreya Hosabale, will live in a tent at the sprawling Hertfordshire County Show ground near Luton, and address a gathering of HSS members and invitees on Sunday. He will then move to London for several engagements during his week-long stay here. HSS says it expects “over 2,200 Hindus from across the UK and Europe” to participate in the event, and they will have a busy schedule for three days. Organisers say “Sanskriti presents the very best of Sangh, from ‘khel’ and yoga to ‘baudhik’ and ‘charcha’”. Topics for discussion during the event include “Geopolitical situation and how Hindutva is the solution”, “How can we shape the next 50 years”, “Yoga: beyond the mat”, “Spirituality beyond religion” and “Dharmic capital”. The organisers say the open air venue in the countryside has been transformed into a fully tended township, with more than 400 tents, infrastructure built from scratch and amenities required during the three days. According to Shah, the theme of the gathering is ‘sanskar’ (value of life), ‘sewa’ (selfless service) and ‘sangathan’ (community spirit). Every effort was made to use recyclable materials to generate awareness of environmental sustainability, the organisers said. With an average weekly attendance of 2,000 at more than 110 shakhas, HSS has a presence in most parts of Britain. MPs with large Hindu populations in their constituencies – such as Bob Blackman (Conservative, Harrow East) and Barry Gardiner (Labour, Brent North) – support its activities. HSS functionaries were involved in organising the diaspora event at Wembley Stadium addressed by Prime Minister Narendra Modi during his November 2015 visit. Several RSS ‘pracharaks’ and functionaries have travelled from India over the years to work in Britain for certain periods and some organisations of the Sangh Parivar have branches in Britain, including the Vishwa Hindu Parishad. According to the latest annual statement filed with the Charity Commission, HSS’s main objective is to advance Hinduism and “educate the public in the Hindu ideals and way of life”. Its activities include setting up branches “where Hindus of the UK could congregate, provide facilities for training of body and mind and develop good character”, organise leadership courses and arrange lectures and discussions. In February 2015, the Charity Commission launched a statutory inquiry after an undercover investigation showed a teacher at a camp organised by HSS for children in Herefordshire making strong remarks against Christians and Muslims. HSS launched its own inquiry, extended full cooperation to the investigation and said it will in future take “even greater care that no views are expressed from its platform that could directly or indirectly promote interfaith discord”. In the financial year ending March 2015, HSS said its income was £201,381 and expenditure £201,332. One of its largest expenditures mentioned was for “Shakha – hall hiring”. HSS said in the annual return it rented part of its property in Birmingham to Sewa International, another registered charity organisation, of which HSS is the sole member..